To Receive Free Retail Display: Order 24 packs of item 61747. 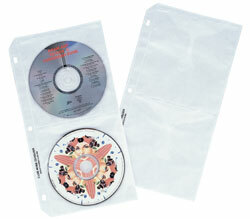 CD-safe polypropylene pages conveniently store CDs and documents together in your ring binder. Made from acid-free polypropylene so contents wont stick. Stores 2 CDs with documents. Fold-over flap secures CDs in place. Fits standard ring binders. Reduced glare. For 11 x 8-1/2 documents. 10/PK.